Portadown thirds enjoyed a comfortable path into the next stage of the Harry Cavan Youth Challenge Cup thanks to a weekend win over Warrenpoint Town. The rearranged cup tie resulted in a 6-1 success at Kernan for Chris Wright’s players. Nathanial Ferris’ volley kicked off the scoring before Adam Brown slotted home a penalty kick and an own goal increased the advantage. Peter Campbell produced a fine individual effort as he flicked the ball over a defender then found the net with an acrobatic finish. Campbell and Joel Copes pushed the Ports into a 6-1 lead. PORTADOWN: Conor Larkin, Eoin McConville, Joel Adams, Adam White, Scott Megaw, Tiernan Judge, Thomas Aston, Paddy McPartland, Peter Campbell, Adam Brown, Nathanial Ferris. Subs: Andrew Wilson, Joel Copes, Mark Johnstone, Kevin McAlinden, Zak Crooks. 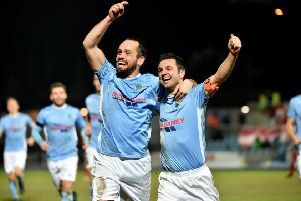 The thirds will now face Ballymena United on December 5, with the quarter-finals the reward. Portadown return to NIFL Youth League Section A duty tomorrow (Saturday) at Kernan against Dungannon Swifts Youth, with kick-off at 11 o’clock. The reserves’ next league fixture is scheduled for a visit to Linfield Swifts on Wednesday, December 2.